More like a ‘pilgrimage’ than a performance, this exquisite album features, in its first part ‘Stabat Mater’ in eight settings which have been written by eight composers ranging in the baroque to the modern day, from Vivaldi to Poulnec. 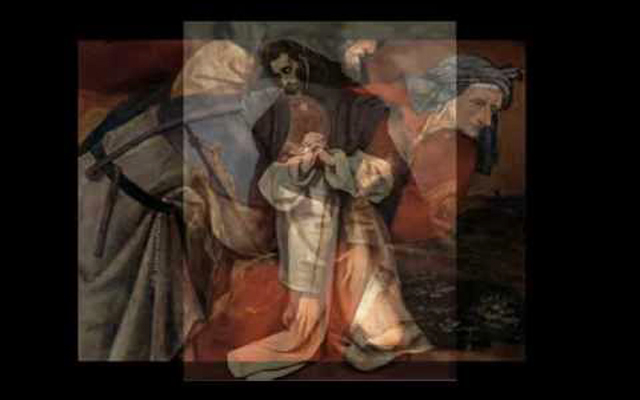 And in its second part are three works ‘in the spirit of St. Francis of Assisi’, written by Eli Tamar. The album ends with the ‘Canticum Fratris Solis’ a religious song composed by Saint Francis of Assisi. 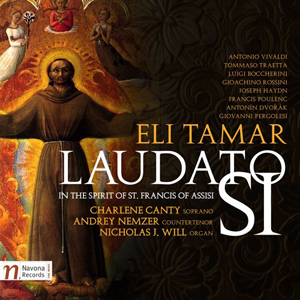 In both the ‘Stabat Mater’ as well as in his own three compositions positioned as ‘Laudato Si: in the spirit of St. Francis of Assisi’ Eli Tamar gives notice that he is both interpreter and composer of no mean instinct. These eleven performances benefit from his judiciously clear-eyed direction; numerous facilities within these composers’ (including his own) meticulously detailed canvases are skilfully brought out, and Tamar has a measure not only of the ‘Stabat Mater’ in all its profound melancholy, but also of the open-hearted mysticism of St. Francis of Assisi. Nicolas Will’s transcriptions of eight versions of ‘Stabat Mater’ are, quite simply, inspired. He launches most propitiously with a raptly intuitive account of Vivaldi’s ‘Stabat Mater Dolorosa’. Not only is the marvellous intertwining of voice and organ, but Will sees to it those textures have an authentic baroque glow. Andrey Nemzer voices the alto here and elsewhere, in other versions of the prayer, with endearing freshness. It might be speculated that the Hymns of Mary might be better suited to the female voice, but Nemzer’s range is really in the upper reaches of countertenor, but his monumental performance says otherwise. To assuage whatever criticism might have ensued Nicholas Will has arranged three other versions of the ‘Stabat Mater’ for the luminous soprano of Charlene Canty. Tamar couldn’t have done better as Canty’s versions are positively diamantine, supremely expressive and unforgettable in their intensity. Thus when Nemzer and Canty come together in the two remaining versions their duets are simply glorious. The rest of the repertoire comprises works by Eli Tamar that are based on the prayers of St. Francis of Assisi, one of the most revered figures in Roman Catholic history. The challenge here is much more adapting the prayers for music, rather it is immersing that music in fundamental mysticism of the Franciscan way, providing appropriate and engaging essays on artistic choices when tackling the prayers, in addition to carefully preserving their sanctity. Eli Tamar’s ear is masterfully attuned to creating music for the voices of Andrey and Charlene Canty which have been nobly set out, creating a superb duet with judicious weight and solemnity. There is also a perfect balance between throbbing basso continuo line of Nicholas Will’s organ and the expressive duet declamation, especially in the ‘Canticum Fratris Solis’, the ‘Laudato Si’ of St. Francis of Assisi. Overall, this is a highly accomplished performance born of inspired compositions rendered utterly memorable by the voices of Charlene Canty and Andrey Nemzer, with a virtuoso performance by Nicolas J. Will on a gloriously maintained organ.